I couldn’t believe what I had read at http://comments.ua/life/395524-perevodchik-google-zamenyaet-ukrainu.html : the online google translation service in its Ukrainian-to-Russian mode gives the meaning of the adjective «загальноукраїнський» (“all-Ukrainian”) as «общероссийский» (“all-Russian”) – see the enlarged picture by clicking on it. I decided to test the service. One could attribute the mistake to the “stupidity” of the machine. As for me, it brings to mind a line from a Russian song: “Не сама машина ходит – машинист машину водит.”(“…the machine isn’t moving on its own, there’s a machine operator who is running it”)… Incidentally, the line has turned into a proverb explaining many “inexplicable” things on the territory of the ex-USSR. When I was on my way to work this morning, a middle-aged man stopped me with a question, “Excuse me, do you know if there is any trolleybus service on this route. 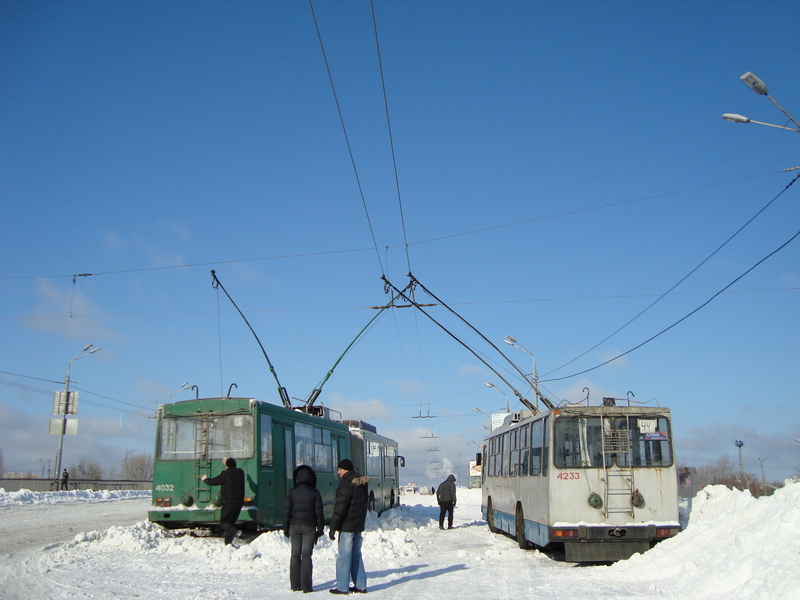 So far I haven’t seen any trolleybuses.” I explained to the man that trolleybuses might be too “intelligent” for this kind of frozen bumpy roads, which is why after the snowfall two days ago the trolleybuses were taken out of service and replaced by buses. The man nodded his head understandingly. And then he said, “It may be off topic, but… don’t you need a pair of trousers to be made for yourself? 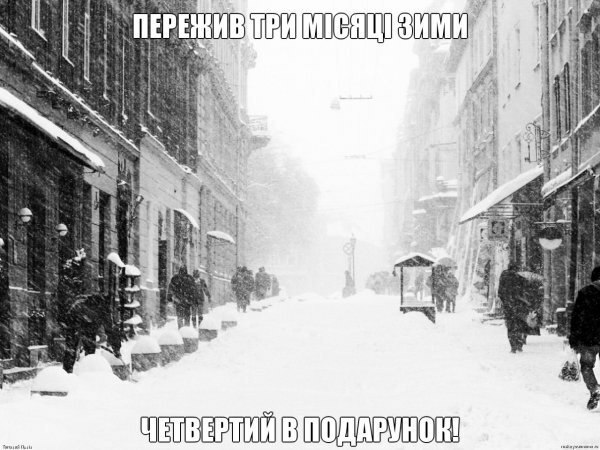 I’m a tailor.” – “No, no”, I said, starting to walk again. “I don’t need any.” – “Or, maybe you have some Soviet-manufactured cloth at home?” His voice sounded hopeful behind my back. “Sorry, we haven’t got any”, I smiled to myself. I have always marveled at people’s ability to find niches for their business. 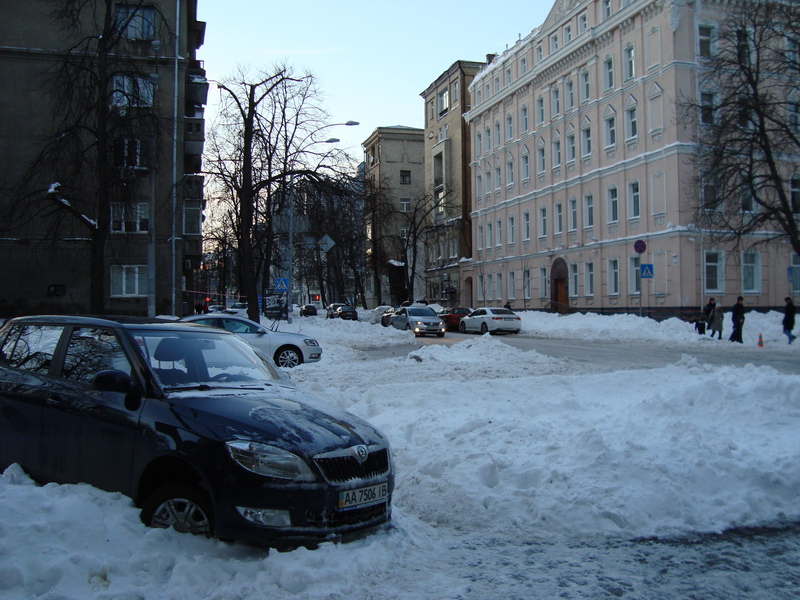 The heavy snowfall in Kyiv gave rise to entrepreneurial spirit. 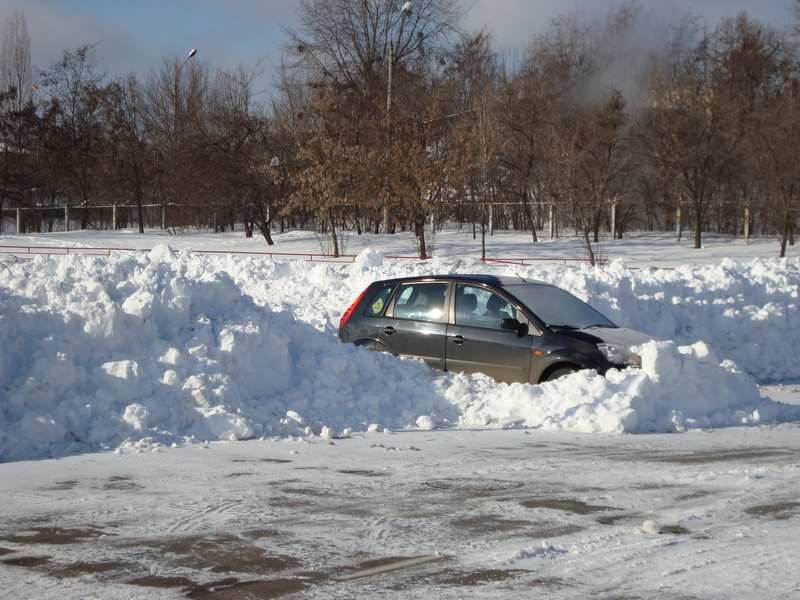 This morning I received quite a few emails with offers to find my car in the snow and to dig it out. That is supposed to cost me about 7 USD. Clearing the area in front of my entrance door runs up to 350 hryvnias ($44). 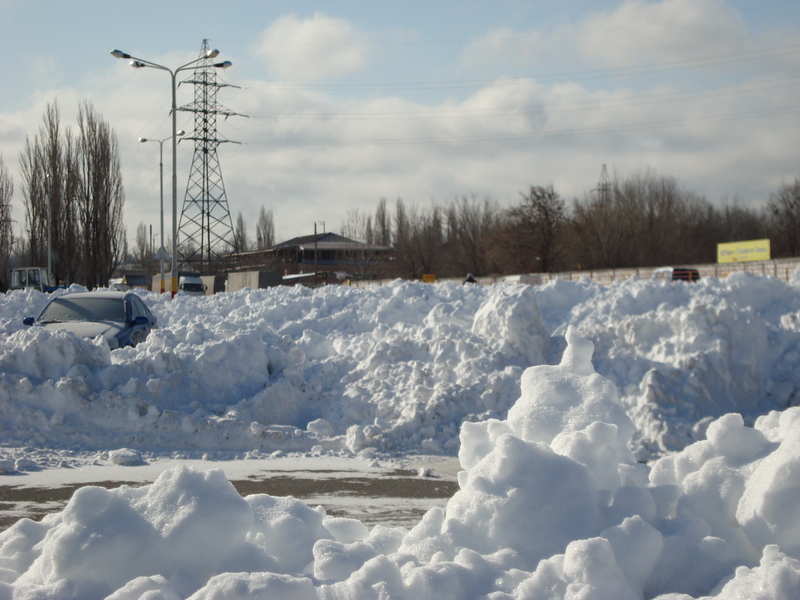 Some guys who own tractors commit themselves to clearing a stretch of the road for 400 hryvnias, and should I want the snow to be transported away by a truck, I will have to come down with 600 hryvnias ($75). Facebook exploded with 4,446 shares and 4,009 likes within 11 hours after a user Svyatoslav Roman posted this picture. 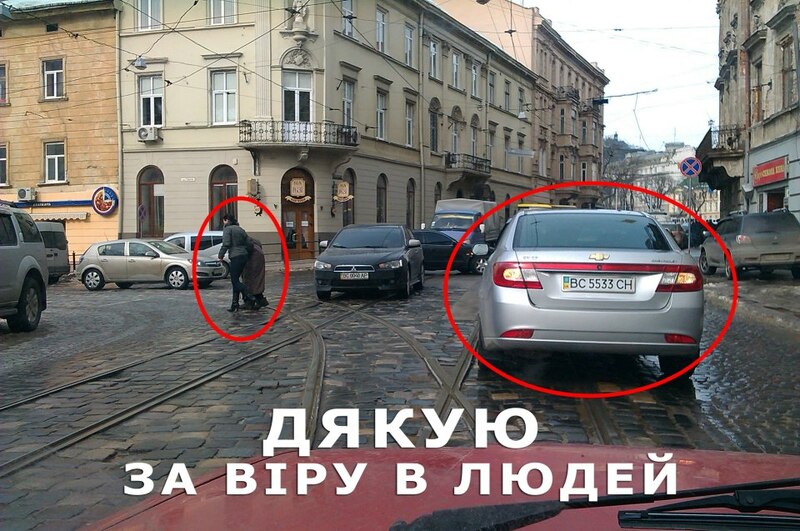 Svyatoslav had been driving his car following a Chevrolet along a busy street of Lviv. On the sidewalk some way ahead he noticed a stooping old lady who was trying to cross the street. The woman looked poor and weak. She made a step forward and then she backed again on to the sidewalk – the traffic was too heavy. It looked like she could wait like that for some longer time. However, the Chevrolet in front slowed down and stopped turning the hazard lights on. A young woman stepped out from the passenger’s seat next to the driver, came to the old lady and carefully helped her across the street waving for the oncoming traffic to stop. Some restive drivers on the road who first had begun to honk, were now patiently waiting. The traffic was resumed after the woman returned to her car and the Chevrolet had started again. I was also moved by the story. However, presuming that it could be only one of similar stories, I surfed the Internet to find a related event in Krasnoyarsk (http://www.youtube.com/watch?v=60dliH7FjcI ). 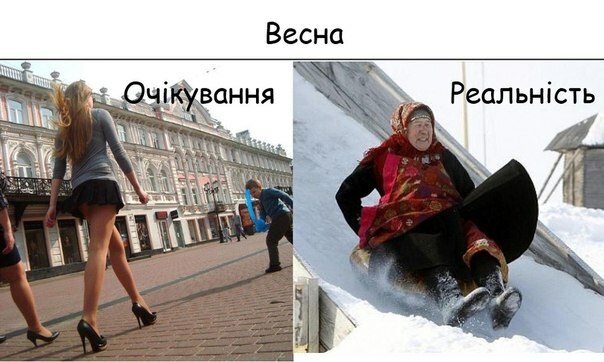 In another situation, a journalist from Kamchatka, having dressed as an old woman, proved that kindness and helpfulness she experienced in her new status on the part of other people are still prevalent values (see http://www.youtube.com/watch?v=_9jQM_WPf2w) . For all that, at the address http://www.youtube.com/watch?v=B5hH8bq2ExQ human compassion was made an object of derision when young individuals tried to play what they thought was a practical joke on people. Cases as the last one might make you somewhat cynical, and you may later think twice before giving someone help. However, true kindness and true sympathy will always stop your car and you will always help a person who needs your attention and reassurance to get to the other side of the street. And you will pay no heed to impatient honks, or to how naïve you may look when a practical joke is played on you. After my click the post from Lviv received the 4,010th like. Pits or holes in a road surface produced by wear or weathering are called potholes, or chuckholes. In Ukrainian a pothole is known as “yama.” The phenomenon is so common for this country that the word has been borrowed by the English-speaking expats living in Kyiv, and they use it along with other Ukrainian exotic vocabulary, like “remont“ (renovation),” rynok” (outdoor market), “marshrutka” (shuttle bus), etc. 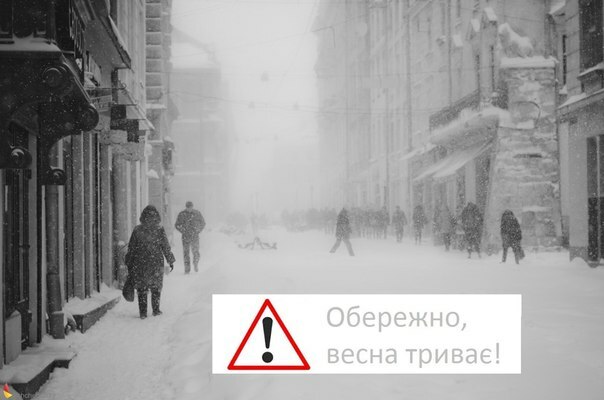 Of late the government has launched a country-wide project of filling in the potholes, which in “bureaucratic speak” sounds “likvidatsiya yamkovosti” (an approximate translation: eradication of “yamancy”). This morning the project has been completed by a heavy snowfall: all the “yamas” have been filled in. The street outside is unusually still. I browsed the Internet for the latest news and picked up some photo jokes to re-post in this blog. DANGER! SPRING IS GOING ON! I’m drinking Indian tea contained in a Yorkshire tea-bag which I placed in a Georgian cup. 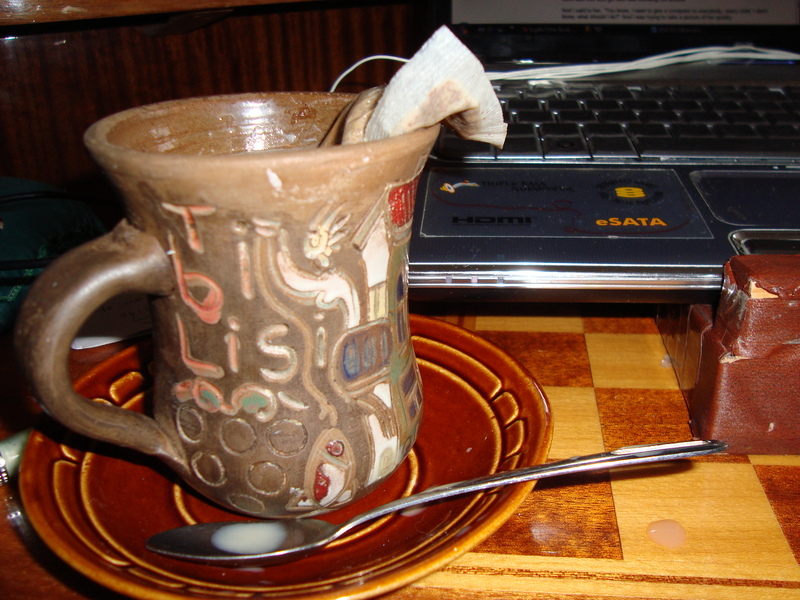 I added Ukrainian milk to the tea , put a grain of Swiss-made Stevia to make it sweeter and started stirring the tea with a Belgian BergHOFF teaspoon while working on the HP (American) laptop manufactured in China. The British educationalist Sugata Mitra is the winner of the 2013 TED prize. I heard his speech about the School in the Cloud at the address http://www.ted.com/talks/sugata_mitra_build_a_school_in_the_cloud.html Mr. Mitra’s talk was persuasive, inspiring, scintillating with wit and permeated with kindness, and I said to myself that the scholar probably deserves all the titles and degrees he possesses: the Professor of Educational Technology at the School of Communication and Language Sciences at Newcastle University, Chief Scientist, Emeritus at the global talent development company NIIT, a PhD in Solid State Physics from the Indian Institutes of Technologies. He makes research in the flow of electricity through biological systems, in human mind (neural networks that can decipher the mechanisms of Alzheimer’s disease). He is also credited with dozens of inventions in cognitive science and education technology. The TED prize was won by Sugata Mitra for the Hole-in-the-Wall experiment. Public computers were built into walls in slum districts of Delhi and in rural areas of India and Cambodia, and children were allowed to use them freely. Even without their knowing English and without any formal training the children were taught by the computer. Being a proponent of Minimally Invasive Education Sugata Mitra insists that children can also learn by teaching one another. The maximum they may need are “grannies on the Internet” who may periodically counsel the kids. However, Sugata Mitra’s ideas about de-institutionalizing education seem to be too far-fetched. Firstly, education doesn’t boil down to acquiring knowledge and skills. Bringing up moral and ethical values in children goes along with teaching the three “Rs”. In this connection the teacher’s personality shouldn’t be underestimated. Secondly, learning cannot be based on enthusiasm and interest alone. Learning is hard work and it requires effort, which (considering the propensity of humankind to laziness) can make even the most interesting work monotonous and boring. Thirdly, it wouldn’t be wise to let kids find their ways through the informational maze in the “learn-as-you-go” mode – even with a supervising “granny” behind their backs (six thousand miles away, to be exact). Next to the learner there should be a professional, a supportive friend who knows what intellectual food can be offered to a student day in and day out, and who knows how to push the learner up – gently, lovingly but firmly. Discovery learning, hands-on, collaborative, project-based, task-based and similar approaches that base modern Minimally Invasive Education may be effective, of course – but not when they are applied globally. As an educationalist, I think I can teach a child better English and in a shorter time than his/her peer. Between a teacher and a learner there should always be a “difference in the potentials” that will create the flow of educational charge. And then. I would hardly agree to be operated on by a surgeon who was trained basically through the Hole-in-the Wall or received their degree through distant learning. 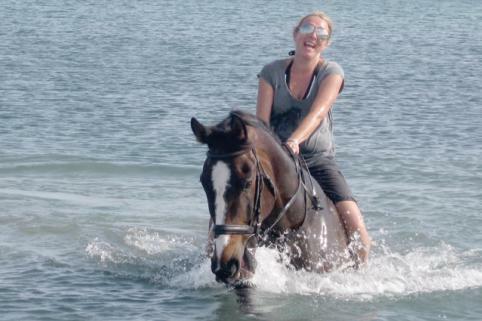 My former colleague once paraphrased the English proverb by saying that we, teachers, should not only lead a horse (= students) to water, but should also make it drink. As it looks, despite its radicalism, the colleague’s thought merits attention. At my place of work I communicate mostly in English, though all my colleagues are Ukrainians. On the one hand, it keeps me professionally fit, on the other, this approach helps those of my good friends who are keen to improve their English skills. There are a few beginners. Some of them are doing surprisingly well as regards their written aspect, though, commonly, learners of English speak better than they write. And then I understood! My colleague was using a machine-translation service. While entering the Russian word “полдня “ (“half of the day”), he had misspelled it and entered the word as two separate words “пол дня “ The Russian word “пол“ – shortening of “половина“ (“a half”) has a homonym “пол” that means “a floor”. That “floor” was used by my colleague. You are currently browsing the BLOGGING IS LIVING blog archives for March, 2013.